Have you heard of this project? 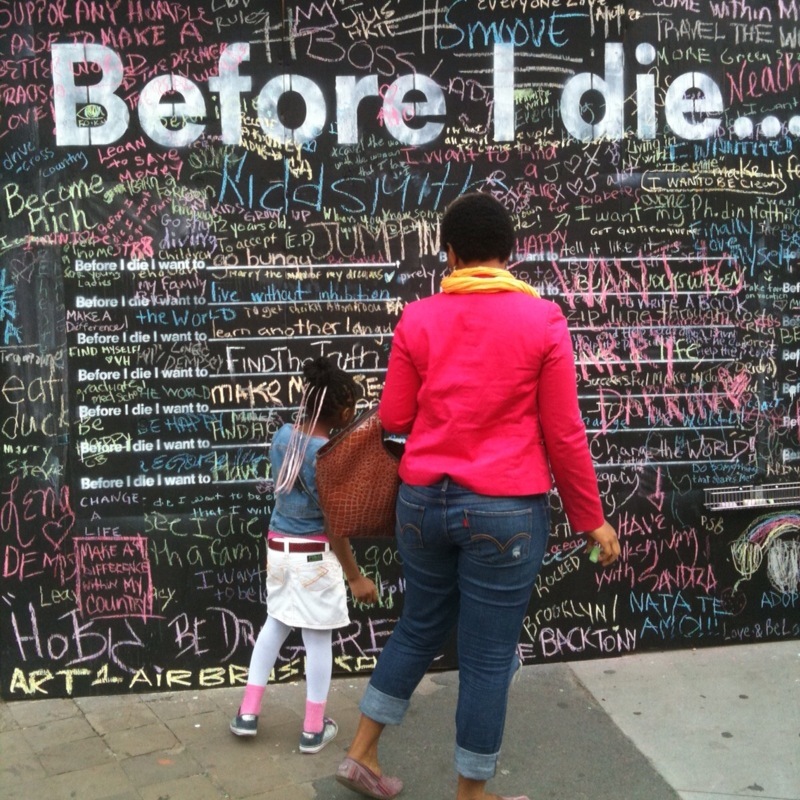 It's called "Before I Die" and it was created by artist Candy Chang. The first installation was in New Orleans earlier this year. 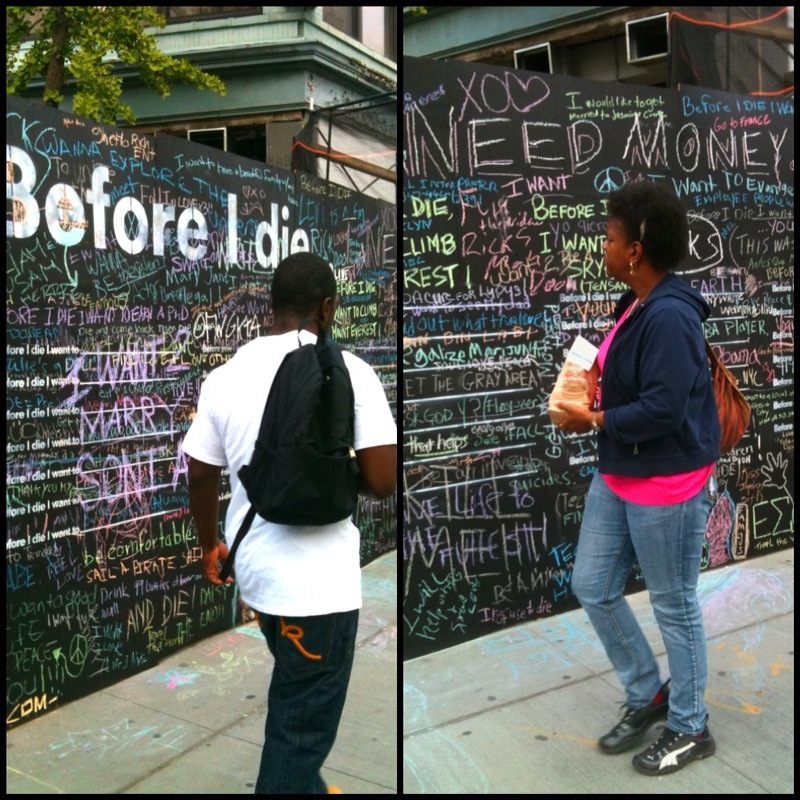 Basically, it's a giant chalkboard where people can write their hopes and dreams for the world to see. One of the goals of the artist was to transform a neglected space into a constructive one. This wall in Brooklyn, NY surrounds a construction site on the Fulton Mall. There is so much written on these walls that you can barely decipher some of it. There are many funny and outrageous things on the wall, and also some words and phrases that are heartbreaking and sad. I didn't write anything of my own, but here are some of the ones I read on the wall. It's an interesting thing to think about isn't it? How would you complete this sentence? On a related theme, I'm over at Mortal Muses today blogging about how life can move so fast sometimes it becomes a blur. Stop by if you have a chance! What a cool project. I'd have to think a bit on what I would add to it. 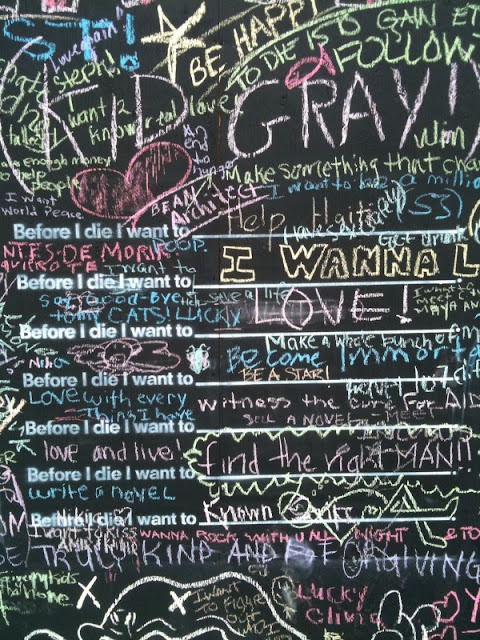 This is a cool idea- such an array of comments, I think the ones that stood out to you were very interesting; I think love (and live) with everything I have is a good one! Sounds like it would be both moving and entertaining to read the wall entries! Love your first image! cool project.. I'd have to think about what I write.. So creative and inspiring! Thank you for sharing this. Before I die, I want to LIVE and LOVE without reservation. candy chang is my street artist hero. her blog is SO cool and her art inspires me in a way that i haven't been inspired in such a long time. i want to make things that have impact too! thank you for sharing her work with us here. Thanks for sharing this positive installation with me, it is very cool! What a beautiful project~ Thank you for sharing it! I am IN love with this idea. Thank you so much for sharing it with us. I might need to make a trip up to Brooklyn sometime soon. Beautiful post! I do love that! I think I even posted about it once! Great post, wonderful project, and now I am left thinking on how we can make it come to life here in my home. We have a chalkboard wall, and maybe the kids and I now have a project to work on. Thanks for the inspiration!! What an incredible project - every city needs a wall like this. 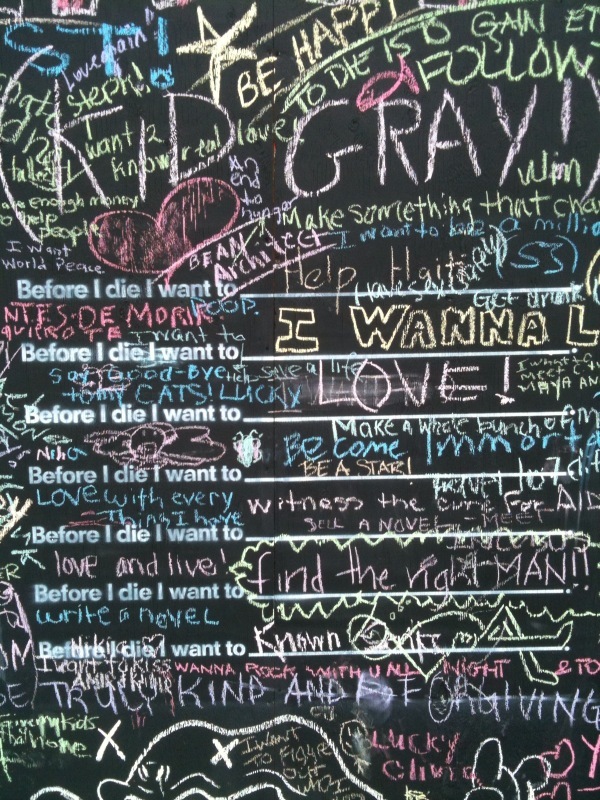 People need to have outlets to express themselves -- so great that someone thought of creating this kind of wall! 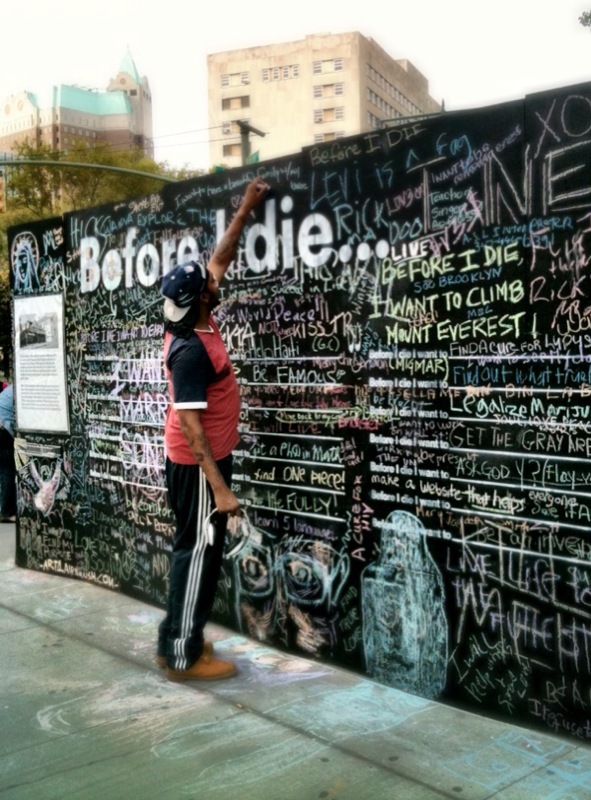 Before I die I want to know that I had made a difference. Thanks for letting me add my bit. This is both wonderful and sad at the very same time. I would love to be able to see this, and how lucky you were to be able to photograph it. Thank you so much for sharing this at The Creative Exchange. It is truly so perfect for it. great project and good list you have too! you took some great pictures of this exhibition and the people interacting with it. There's always more time for dancing in life, isnt' there? 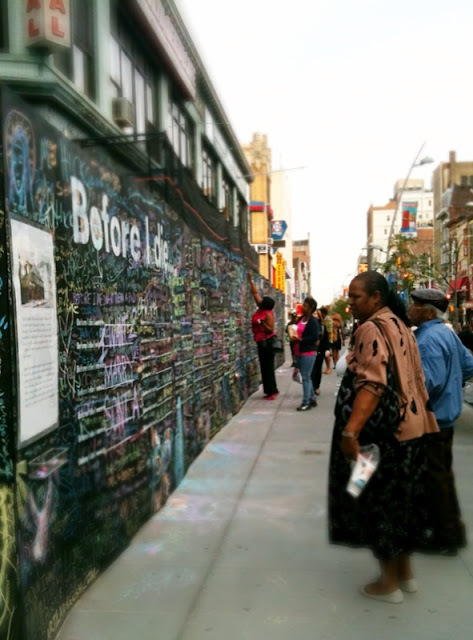 What a wonderful project that allows people to express themselves! LOVE this post! What a great art project...I could have stood and taken photos for hours. I love seeing yours instead :) Great shots! What an interesting project. I would have loved to have seen it. Thanks for sharing it here. The "make peace with myself" is really touching! That's a really great project! Thanks for sharing it! A great project and use space! Thanks for making me aware of it. I saw this installation shortly after going up. Your photo shows the passage of time. I'm smiling. have visited this webpage before, it really made me think about things! This is awesome! I have to visit this when I go to NYC next month!